Vietnam’s foreign direct investment (FDI) from January to August hit $11.25b which is a 9.2% YoY increase, the investment ministry said. Vietnam has denied entry to two prominent rights campaigners invited to attend this week’s World Economic Forum (WEF) on ASEAN 2018 in Hanoi, as the one-party communist state continues its hard line on critics of its dismal rights record. Vietnamese startups do not get the financial support they need from the government at the discovery and validation stages. The ongoing exploitation of petroleum resources in Viet Nam threatens to outpace exploration of new sites, which could lead to a drop in the country’s oil and gas output. In June 2018, Vietnam passed a new Competition Law, replacing the 2004 version of the law. The new law which focuses on competition restraining agreements, market dominance, economic concentration, and unfair practices, will be in effect from 1 July 2019. The uptrend in pepper prices witnessed last month, following incessant rains impacting the crop in Kerala and Karnataka, appears to have been short-lived. The Government has approved a decree to raise fines for food safety violations, which would reach VNĐ200 million (US$5,840) or seven times higher than the value of goods. The State Bank of Vietnam (SBV)`s approval is a major step creating necessary legal framework for the merger of two banks, which is scheduled to be completed by the end of 2018. Japan is the biggest foreign investor in Vietnam in terms of pledged investment capital in January-August. Deputy Prime Minister Vuong Dinh Hue has suggested China’s Guangxi province to continue creating favourable for Vietnamese key products to enter Chinese market. Vietnam has announced eight additional national intangible cultural heritage practices under Decision No.3325/DD-BVHTTDL, recently signed by Minister of Culture, Sports, and Tourism Nguyen Ngoc Thien. Vietnam – with its economy growing at its fastest pace in eight years in the first half of 2018 — is defying the stress in emerging markets as its Southeast Asian rivals face an uncertain outlook driven by trade war risks and a stronger dollar. Vietnam and ASEAN should seize growth opportunities presented by the fourth industrial revolution, PM Nguyen Xuan Phuc said. The number of delayed or cancelled flights operated by national flag carrier Vietnam Airlines and budget carriers Vietjet and Jetstar Pacific in the first eight months of the year was lower than the world average of 25 per cent. Authorities in Vietnam’s capital Hanoi are urging residents to stop eating dog meat because it hurts the city’s image and improper raising and slaughtering of the animals could also spread rabies. GRAB announced on Tuesday its partnership with Vietnam’s MOCA Technology and Service company (Moca) for a mobile payment service in Vietnam, as the ride-hailing firm pushes to cement its position in the Southeast Asian country. Hanoi has paid more attention to the balance of living environment protection in order to develop in a sustainable way for the past ten years. The Mekong Delta city of Can Tho earned more than 10.5 trillion VND (451.5 million USD) in retail and service revenue in August, up 15 percent year on year, according to the city’s Statistics Office. At 10 p.m. on July 12, 2018, FPT chairman Truong Gia Binh was waiting calmly and patiently in front of a screen at the company’s headquarters in Hanoi. Ruchir Desai, senior investment analyst at Asia Frontier Investments, discusses Vietnam and other frontier markets in Asia. More than 100 exhibitors from 25 countries and territories will showcase their latest products and technologies used in the medical, pharmaceutical and hospital industries at the 13th Pharmed & Healthcare Vietnam in HCM City next week. Securing long-term finance is considered a common challenge for Vietnamese banks, CafeF reported. 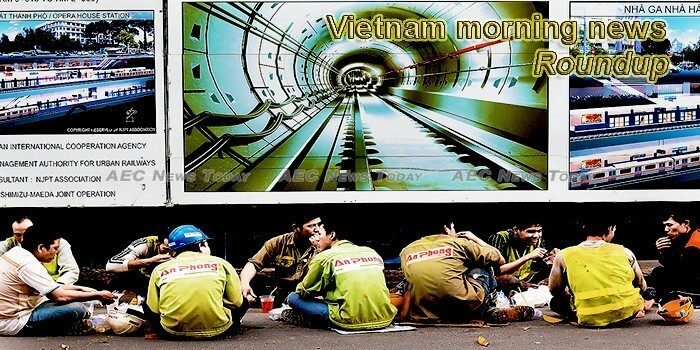 Domestic private investment is yet to fulfill its increasing role as a driver of Vietnam`s lower middle-income economy, according to UNDP`s director. Indonesian President Joko “Jokowi” Widodo says his country and Vietnam have agreed to cooperate more in fighting illegal fishing and hope to boost two-way trade. Malaysian companies need to step up in their automation efforts to ‘future proof’ their core businesses and unleash innovation to stay ahead of the competition, said Malaysian Digital Economy Corporation (MDEC) chief executive officer Datuk Yasmin Mahmood. Southern localities have harvested nearly 962,000 hectares of total rice farmed in the summer-autumn crop this year, equivalent to 88.7 percent of the same crop last year, according to the Ministry of Agriculture and Rural Development (MARD). The statement was made by Deputy Prime Minister Trinh Dinh Dung at Grow Asia Forum 2018, alongside the World Economic Forum on ASEAN 2018 (WEF-ASEAN 2018) held in Hanoi on September 11-13. “VITA – La Chan Vang” (VITA – Golden Shield) helps customers secure peace of mind in being protected against all types of cancer. The fishery sector needs to take actions to convince the European Commission (EC) to remove a “yellow card” warning on Vietnamese seafood so as to realise the set target of 9 billion USD in export turnover this year. The ComBeFIVE vaccine is undergoing quality checks and will be delivered to injection sites next week, the Drug Administration of Việt Nam announced on Monday.